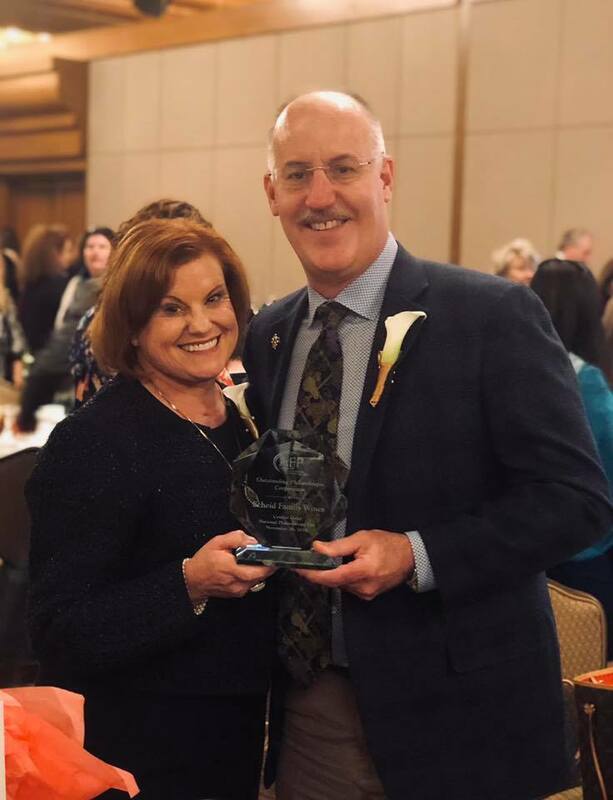 Scheid Family Wines was named "Outstanding Philanthropic Corporation" for 2018 by the Central Coast chapter of the Association of Fundraising Professionals at the annual National Philanthropy Day event held at the Inn at Spanish Bay in Pebble Beach, CA. The Association of Fundraising Professionals Monterey Bay Chapter was founded in 1993. Its purpose is to advance the professionalism of individuals working in all fields of development and fundraising, especially at the administrative decision making level, through local networking, education and training, and national and statewide lobbying efforts. The local Chapter offers workshops and programs in conjunction with the Community Foundation for Monterey County, hosts networking opportunities and offers a mentorship program. 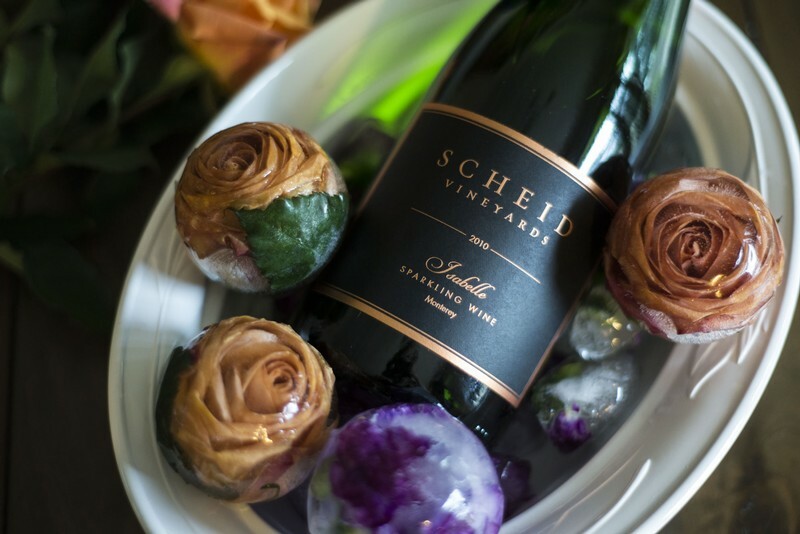 Scheid Family Wines is very active within the Monterey County community. Each year, we donate over 300 cases of wine to local, non-profit organizations. We also organize the Annual Scheid Writing Contest, a writing contest that awards scholarships to local high school students. The Scheid Writing Contest was originally created by Al Scheid in 1984 for his high school alma mater, Bridgeport High School in Bridgeport, Ohio. He launched the contest as a way to give back to the community and provide assistance to motivated high school students who wanted to attend college. Four years later, convinced that the local schools in the Salinas Valley could benefit from the contest, Al brought it to King City High School. Greenfield High School—built on land that was formerly vineyards owned by Scheid—was added to the program in 2001. Al has always believed that being able to communicate ideas effectively is the key to success. He created the writing contest to give students the opportunity to fully delve into a subject. Each year, the winners are chosen based on their ability to research and write a 3-5 page essay on a given topic. Separate scholarships are awarded for each grade level. Past topics have included Guantánamo Bay and interrogation techniques, the Ground Zero mosque, the impact of social media on society, the death penalty, immigration reform, global warming, the USA Patriot Act and its effect on an individual’s right to privacy, the use of military tribunals in terrorist cases, and the pros and cons of the Electoral College. Now celebrating its 30th anniversary in Monterey’s Salinas Valley, the program has donated more than $320,000 to scholarships for local high school students. An elegant cheese board makes for the perfect appetizer – with a quick visit to your local cheese shop or specialty cheese section and a few minutes to assemble, you have an appetizer that is a definite crowd-pleaser. 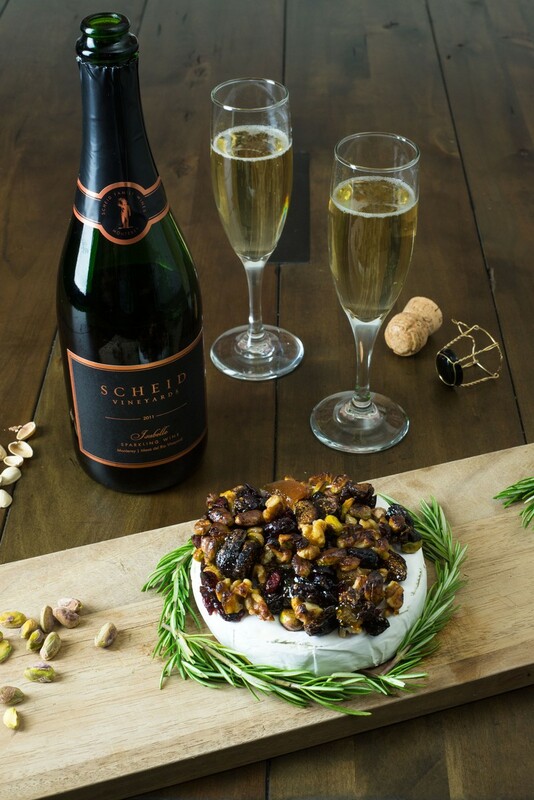 Pair different styles of cheeses with different wines to accommodate red and white wine drinkers and include a variety of dried and fresh fruits, cured meats, and nuts to round out the selection. A few fresh rosemary sprigs make for a beautiful holiday-ready garnish. Pair with a large format bottle for extra effect! Young and Fresh – this includes fresh cheeses like mozzarella and riccotta, but goat cheese is the most wine-friendly of this category. Try both spreadable goat cheese and the harder and more pungent aged crottin style. 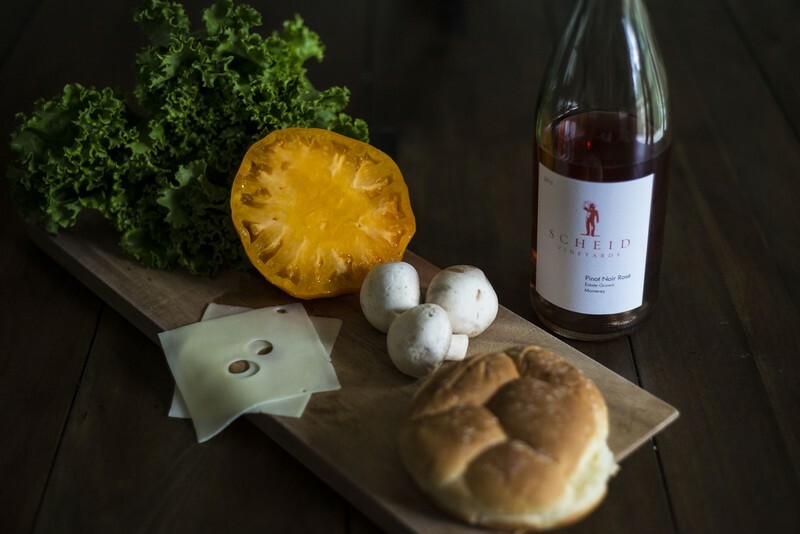 Pair young and fresh cheeses with rosés, sparkling wines, dry white wines, and low-tannin reds like Pinot Noir. Soft, Medium-Aged – this includes cheeses that are still soft but are aged for a few months like Brie and Camembert. 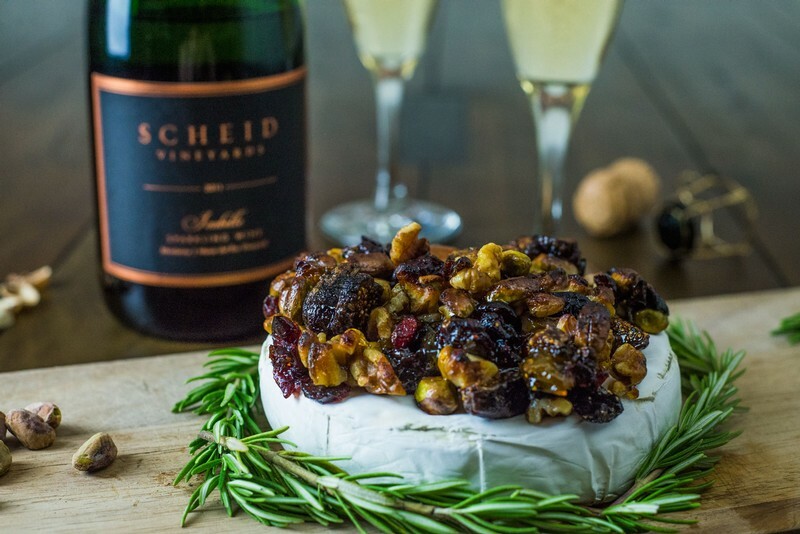 These cheeses are some of the most versatile on a cheese plate, pairing well with both white and red wines and with a variety of fruits as well. Not too soft and not too strong, these cheeses still have enough flavor to stand up to a wide range of wines. Semi-Hard, Medium-Aged – Emmental, Gruyere, Jarlsburg, Monterey Jack and young Cheddar make up this category. 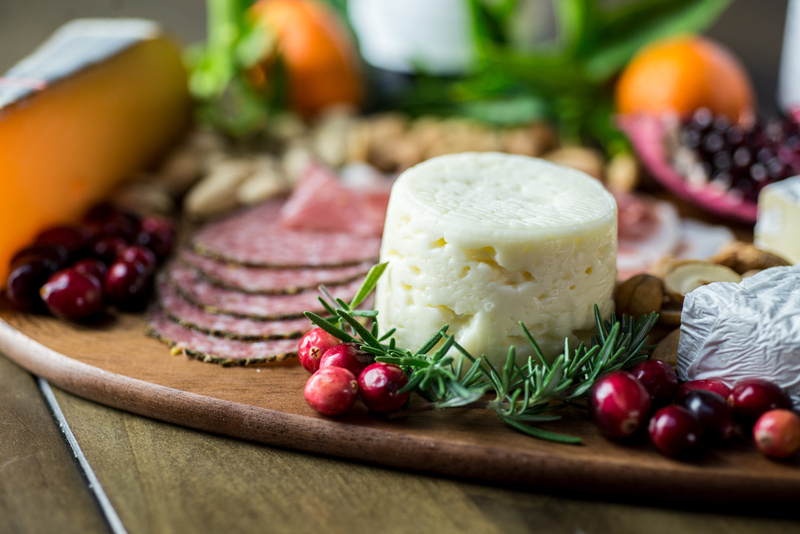 Medium-bodied whites like Pinot Blanc, Viognier, and white Rhone Blends and fruit-forward, lighter-bodied reds like Pinot Noir, Merlot, and Zinfandel pair well with these cheeses. Hard, Aged – Aged Cheddar, Gouda, Parmesan, Asiago. Pair these cheeses with bold reds and full-bodied white wines. The aging process concentrates the flavors of the cheese meaning they can hold their own against bold red wines. Look for cheeses aged longer than six months. Preheat oven to 425° F. Line baking sheet with aluminum foil, spread rinsed and trimmed fingerling potatoes in one layer; drizzle with olive oil then season with salt and pepper. Roast for 30 - 45 minutes, until potatoes are golden brown. While potatoes are roasting, rinse and trim tough ends of asparagus; set aside. Season steaks on all sides with salt and pepper to taste. Heat a cast iron skillet medium high heat until pan is very hot, then add two tablespoons olive oil. Add steaks to pan and allow to cook undisturbed for 4 minutes (set timer). Turn and cook another 4 minutes for medium-rare (internal temperature of 135° F), 6 minutes for medium (140° F) or 9 minutes for medium-well (150° F). Remove steaks from pan and cover with foil. While steaks are resting, add one tablespoon butter and ¼ cup chicken stock to steak pan, keeping flame on medium high. Add asparagus, season with salt and pepper to taste and cook for 4 – 7 minutes, depending upon diameter of asparagus, until bright green and tender. Serve potatoes, asparagus and steak immediately. Thoroughly mix the apricot preserves, chopped figs, cranberries, pistachios, and chopped walnuts in a small bowl until well coated. Place the round of brie in a small cast iron skillet or oven-safe dish and top the brie with the apricot mixture. Bake at 400F for ten minutes or until brie is warm and softened. Once the brie is softened, turn the oven to broil and broil the brie for 30 seconds or until the nuts begin to brown (be careful not to burn the top). Remove from the oven and decorate with fresh rosemary sprigs. Serve immediately with sliced baguette or crostini. Heat olive oil in a large Dutch oven, add onions, garlic, and thyme, then sauté over medium heat until onions are tender. Place salt, pepper, and flour in paper bag, shake to combine then place beef cubes in bag and shake to coat; add to pan. Brown the beef on all sides over medium-high heat then add red wine, butternut squash, celery, sundried tomatoes, and beef broth. Bring stew to a boil, then cover and reduce to low; simmer for 90 minutes. 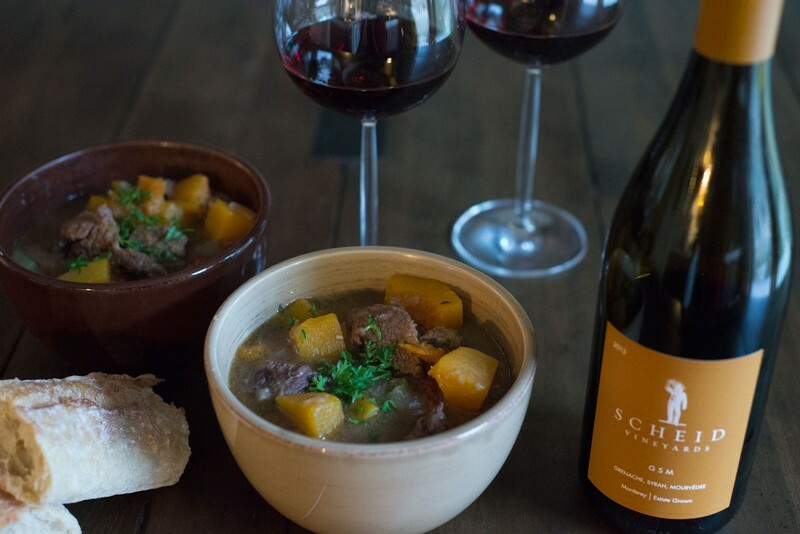 Adjust seasonings, place stew in bowls, sprinkle with fresh parsley and serve immediately with a simple green salad, crusty French bread and Scheid Vineyards GSM. Pinot Noir: a mysterious, beautiful and elegant wine. 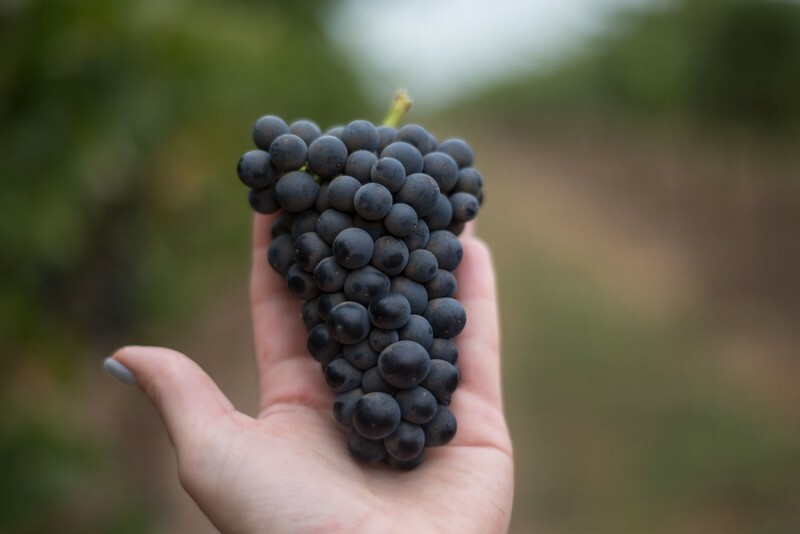 An ancient varietal, Pinot Noir is estimated to be only one or two generations removed from wild Vitis sylvestris vines and Pinot Noir grapes have been vinified (turned into wine) since the 1st Century AD. The name "Pinot Noir" - black pine - refers to the pine-cone-like shape of the grape clusters and the color of the grapes. 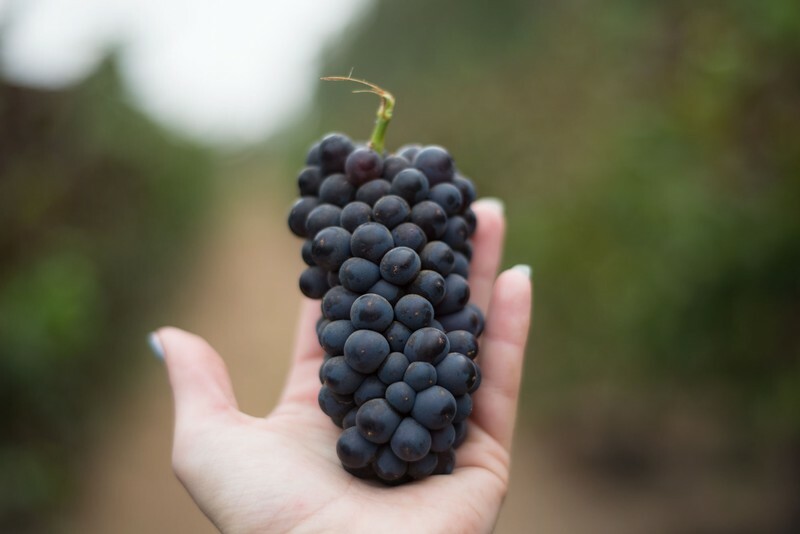 Pinot Noir is one of the seven "Noble Grape" varieties, so named for their popularity and world-wide acclaim: Chardonnay, Sauvignon Blanc, Riesling, Cabernet Sauvignon, Merlot, Syrah, and Pinot Noir. There are approximately 40,000 acres of Pinot Noir in California, 9,000 of which are in Monterey County. Monterey County's unique climate, with coastal fogs and moderate temperatures that extend the growing season, are particularly suited to Pinot Noir's growing cycle. 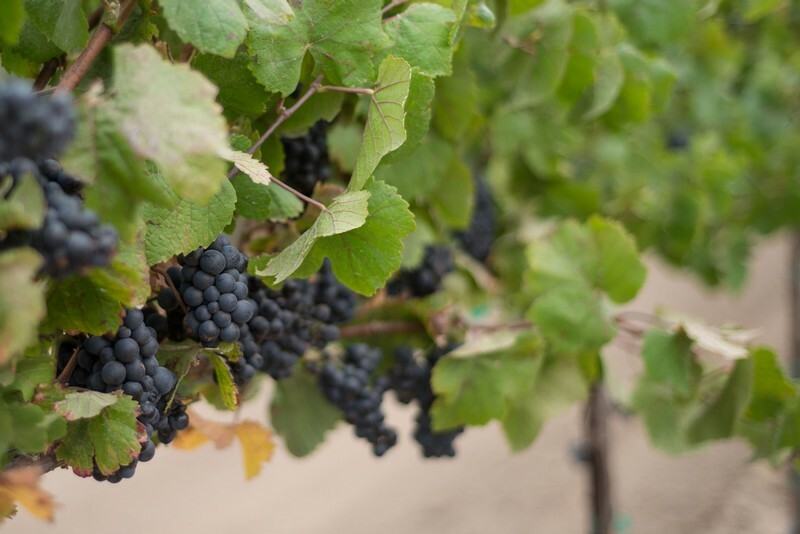 Our extended growing season allow Pinot Noir to mature slowly, developing complex flavors without ripening too quickly. What is a clone? A clone is a specific genetic variation of a type of varieties of grape. 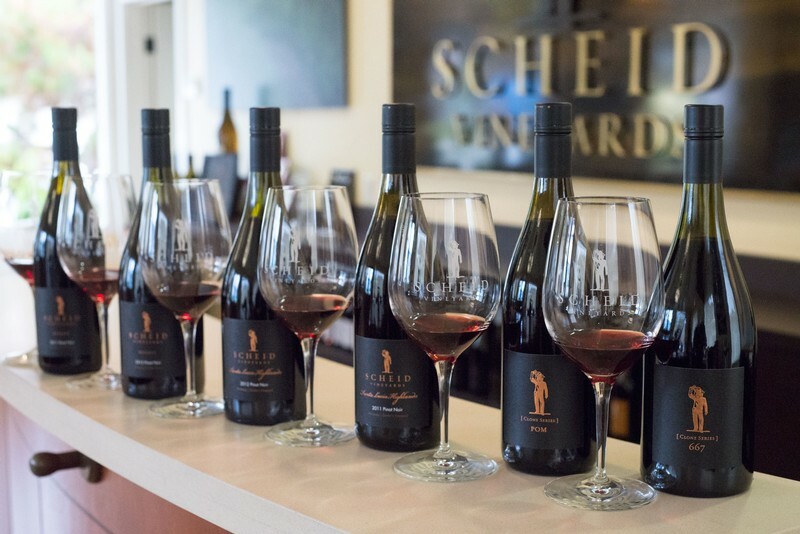 Pinot Noir mutates easily, and there are over 1,000 different clones of Pinot Noir, the most of any varietal. A typical bottle of wine labeled "Pinot Noir" will actually be a blend of a number of different clones. 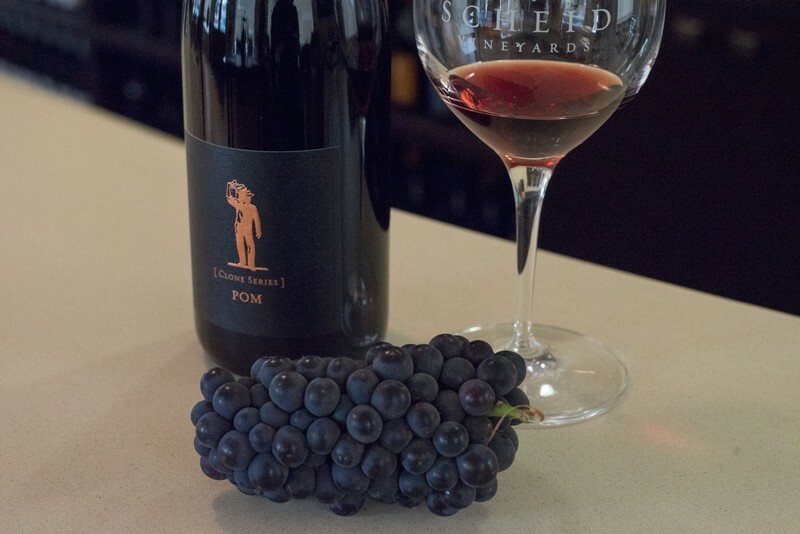 The Pommard Clone was brought to the U.S. in the 1950's from Château de Pommard in the Burgundy region of France and is known for its earthy, fruit forward characteristics, as well as structure and density. Known as a great “stand-alone” clone, it can display a meaty, gamey character with dark fruit. 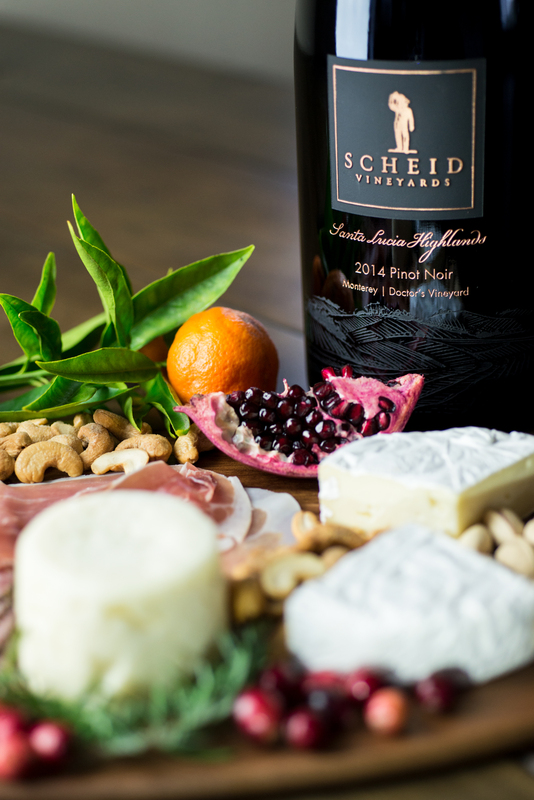 A dramatic and vibrant wine, our Scheid Vineyards Clone POM has aromas of black cherry, raspberry, cola and vanilla mingled with a hint of clove. It is a classic Pinot Noir, with soft tannins and round, rich, red fruit on the palate. In the 1980's Dr. Raymond Bernard from the University of Dijon, conceived the idea of “clonal selection” or taking buds from vines showing no evidence of viral disease and possessing desirable characteristics. These clones, named the "Dijon Clones" after the return address on their shipping container, were imported from Morey St. Denis to the University of Oregon and quickly grew in popularity in the United States. 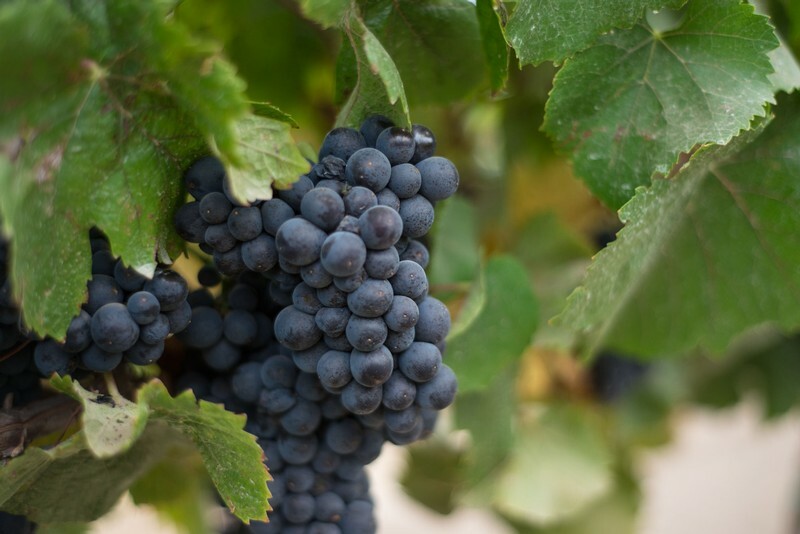 Some of the most popular clones of Pinot Noir, including 115, 667, and 777 are Dijon clones. Clone 667 tends to be structured and works as a great backbone in a blend. High-toned and bright with quality aromas of dark cherry, raspberry and spice and soft tannins. 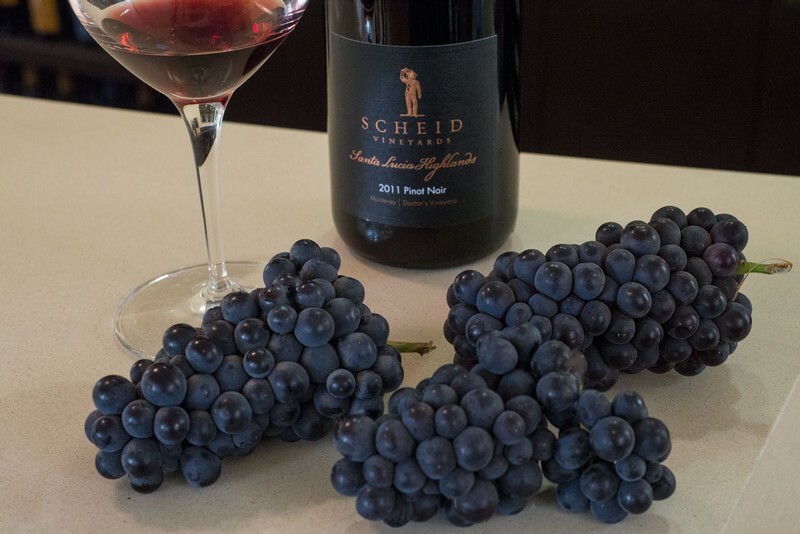 An elegant wine, our Scheid Vineyards Reserve Clone 667 is silky in texture and complex in flavor, with black cherry and raspberry fusing perfectly with an exotic undertone of licorice and black spice. Clone 777 (pictured above) is known for being dark, rich, and structured with an intense color. Earthy, dense, and complex. 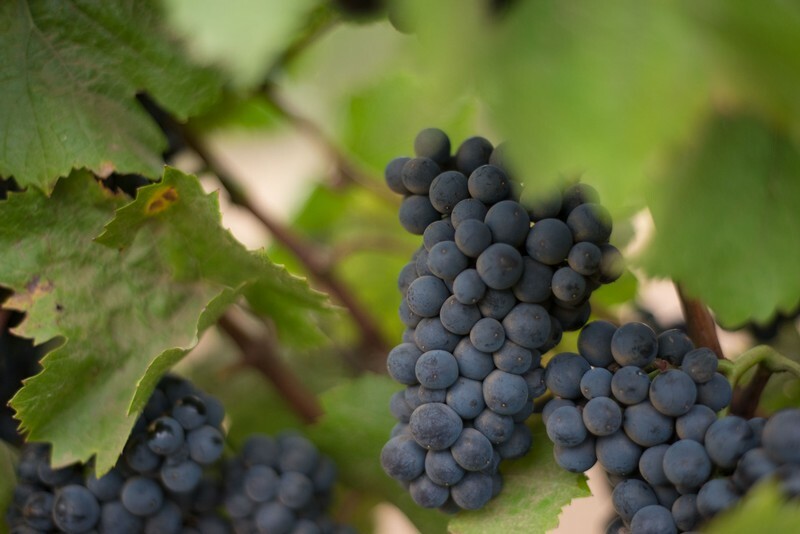 Clone 115 is one of the most widely planted clone of Pinot Noir. Round, rich style. Noted for great balance and aromatics and one of the most common to be bottled as a single-clone wine. We're looking forward to releasing our 2013 Reserve Clone Series 777 and 115 next year. The Santa Lucia Highlands are a very special part of the Monterey County growing region. 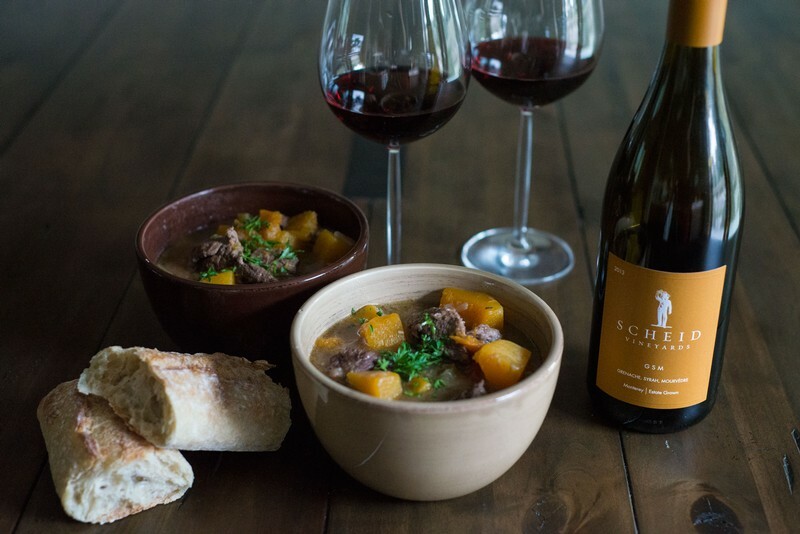 Designated as an AVA (American Viticulture Area) in 1991, the ancient, glacial alluvial soils pair with the morning fog and afternoon winds to create a true Region I climate, perfect for the Burgundian Pinot Noir grape. The loose, nutrient-depleted foundation makes vines struggle to produce wonderfully complex fruit flavors with vibrant acidity. Marine influenced mornings and afternoon breezes coming off Monterey Bay are the foundation for Santa Lucia Highlands Pinot. 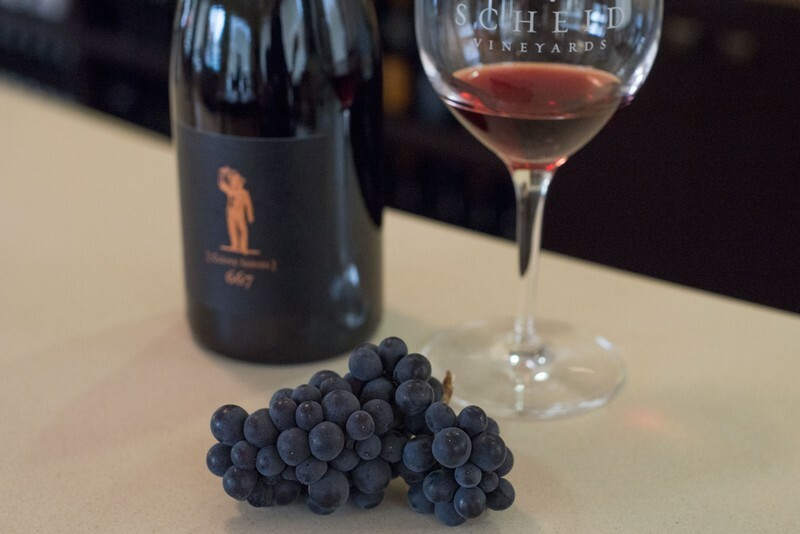 Our Reserve SLH Pinot Noir comes from grapes at Doctor’s Vineyard, planted on the Southeast facing terraces of the Santa Lucia mountain range, overlooking the Salinas River Valley. Intense and complex, this Pinot Noir is rich with black fruits, cherry and anise with a hint of cola. 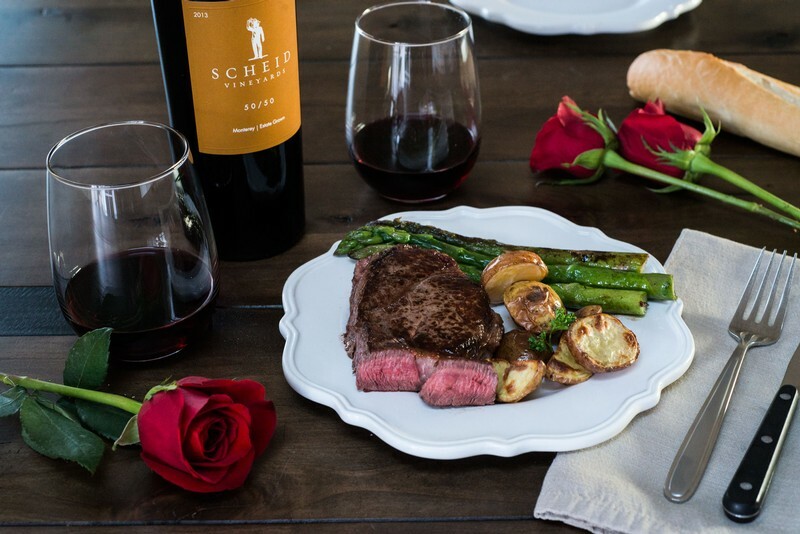 Layers of flavor subtly unfold with a silky, elegant texture and a lingering dark fruit finish. Combine paprika, ½ teaspoon salt, and black pepper in small bowl; rub evenly over pork shoulder. Heat large cast iron pan over medium-high heat. 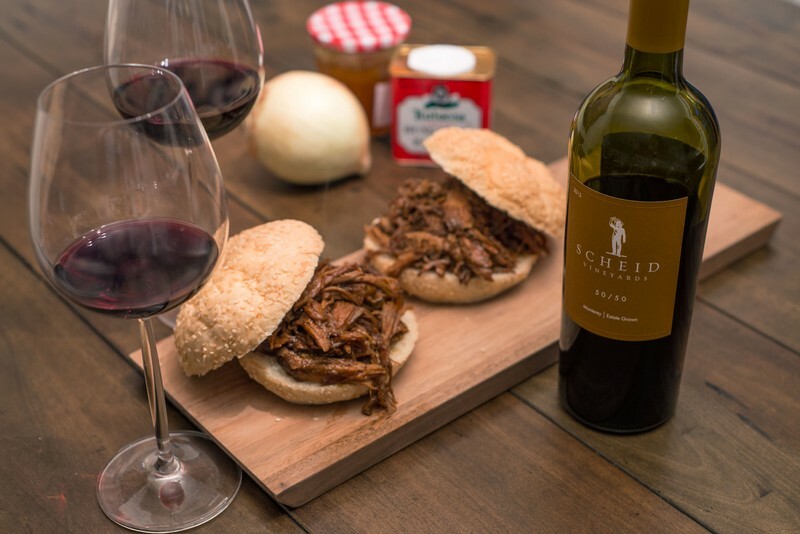 Add 1 tablespoon olive oil to the pan and brown pork shoulder on all sides, approximately 3 minutes on each side then set pork aside in slow cooker while preparing sauce. Add stock, balsamic vinegar, molasses, soy sauce, and red pepper flakes to the cast iron pan; bring to a boil. Gently loosen browned bits on the bottom of the pan with a wooden spoon and add peach preserves. Whisk together until combined and pour over the pork in slow cooker. Add onion and garlic then cook on low for 5-6 hours or until pork is tender and shreds easily with a fork. 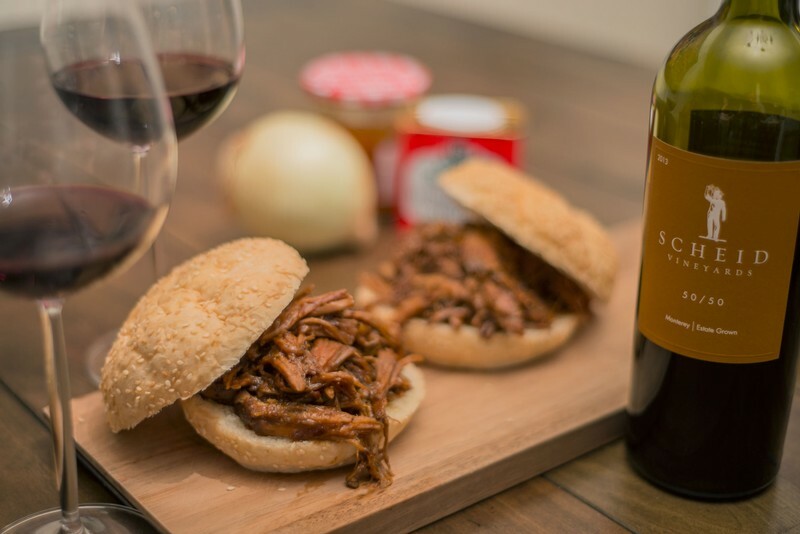 Remove pork from the slow cooker and allow to sit 5 minutes. Separate the onions from the sauce with slotted spoon and set aside. Place a gallon-size, zip-top plastic bag inside a large measuring cup or bowl. Carefully pour the remaining liquid into the zip-top bag and let sit for 10 – 15 minutes, until fat rises to the top. Carefully cut off the bottom corner of the bag and allow the liquid to drain back into the pan but stopping before the top layer of fat. Add 50/50 to sauce and bring to a boil for 10 minutes or until the mixture is reduced to half its original volume. Place cornstarch, salt and 1 tablespoon water in small bowl and thoroughly whisk to form a smooth paste. Add cornstarch-salt mixture to the pan with the rest of the sauce and cook, stirring constantly until sauce begins to thicken, 3 – 4 minutes. Shred pork with two forks and place in a large mixing bowl; add sauce and toss to combine. To make sandwiches, layer pork/sauce mixture with reserved onions or coleslaw if desired. 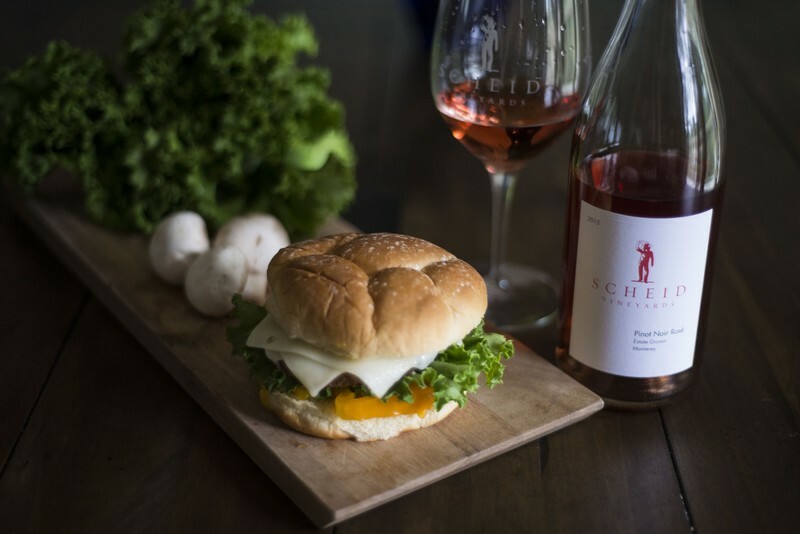 Pair with Scheid Vineyards 2013 Estate 50/50 for a perfect summer BBQ dinner! If you loved this recipe, we'd love to see your photos! Find us on Facebook or Instagram and show us your culinary prowess. Light the grill and turn to medium high heat. Prepare the mushrooms in advance by sauteéing them in olive oil over medium high heat for 5 minutes. Set aside. Add the burgers to the grill and cook until the center temperature reaches 150°. Flip the burgers only once and do not press with the spatula to prevent loss of flavor. When the burgers have finished cooking, remove from the grill and let cool for two minutes. Immediately top with mushrooms then cover with Swiss cheese. Add your favorite condiments and toppings. 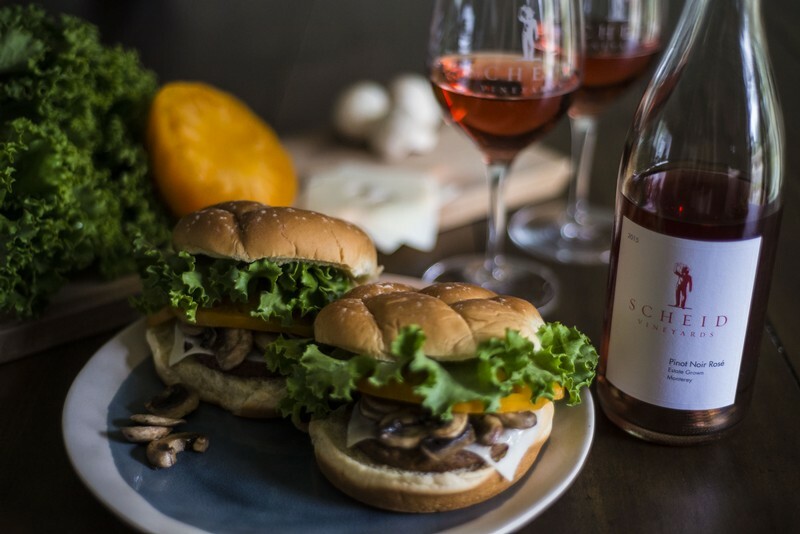 Serve immediately with 2015 Scheid Vineyards Pinot Noir Rosé for the perfect cook-out food and wine pairing! Thoroughly mix Worcestershire, butter, onion, garlic powder, salt and pepper in large bowl. Add beef and pork then gently toss with hands; avoid overmixing. Divide into six equal portions, flatten gently with palm, place on parchment lined pan and place in freezer for 20 minutes. Assemble the flowers you would like to use and trim off the stem just below the blossoms. For ice that is clear instead of cloudy, use distilled water. Make sure the blossoms will fit inside your ice cube molds. Pour a little distilled water into each mold, then add a blossom. Fill the molds with additional distilled water until the flowers are covered. Freeze the cubes overnight. In the morning, carefully remove the ice cubes from their molds. If using a spherical ice mold, run the mold under hot water for three seconds before attempting to open. 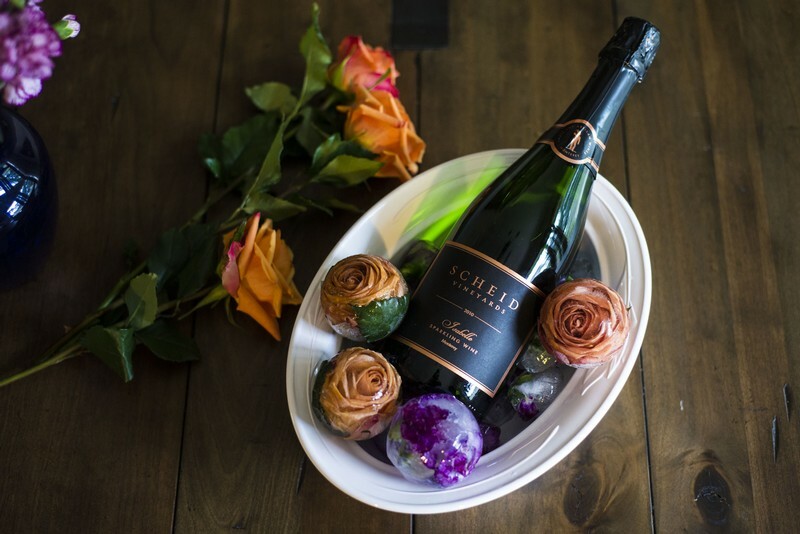 Add as an elegant accent to your wine chiller for weddings, bridal showers, and garden parties! Love this DIY project? Share your photos with us on Facebook and Instagram! 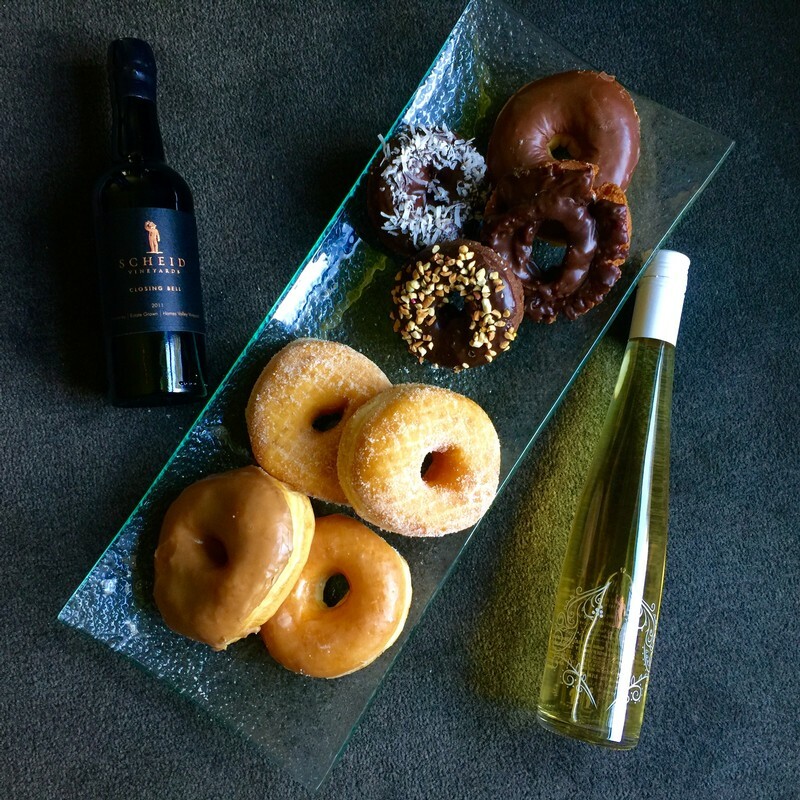 Pairing wine with doughnuts? YES. Elevate your National Doughnut Day by pairing our Closing Bell desert wine with rich chocolate doughnuts or our Late Harvest Riesling with glazed and sugar-coated varieties.